Looking to cut the cable TV cord? The major broadcast networks all beam digital programming over the airwaves for free, but watching live TV is so last century—and without a pricey TiVo or your cable company’s DVR, how can you record shows in order to enjoy them at your leisure, on a screen of your choosing? Really Simple Software’s $149 Simple.TV addresses this problem with a DVR/placeshifter created to record over-the-air or basic digital cable (unencrypted) TV programming and stream it over a local network or via the Internet to a browser or, at launch, to a TV via a Roku box (the service may support other media streamers going forward). If you live in an area with good reception, or can get cheap basic digital cable, and want the benefits of a DVR time shifting and the ability to pause and rewind recorded and live programming—with shows you can get for free, Simple.TV can save you some money. But there are several extra costs, and the product does have some bugs and drawbacks. 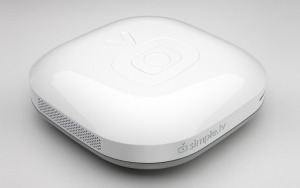 The Simple.TV from the front. Unlike most DVRs, Simple.TV has no storage of its own—you must provide a USB hard drive (that’s one extra cost) if you want to record anything. Although, to be fair, you can use it for live TV viewing (both in the house and outside of it) without connecting a hard drive. It doesn’t hook up to a TV, so you need a Roku to stream content to a TV (the Roku is another extra-cost item). And if you want to stream content to devices outside your home network (like with a Slingbox), or enjoy full DVR functionality (including the ability to set a series recording), you must have broadband with support for 1Mbps uploads, and you must subscribe to the Simple.TV Web service, which at launch costs $50 for a year, or $150 for lifetime service. The Simple.TV's ports on the back. I tried out Simple.TV and its premium service (which the company will offer in a free trial for all customers) in my loft in downtown San Francisco. The device itself is small and white, with rounded edges. It has a coax port for attaching a digital TV (ATSC) antenna or basic digital (ClearQAM) cable (it doesn’t support analog cable); an ethernet port for connecting to your home network (it doesn’t support Wi-Fi); and a USB port for the hard drive. Once you’ve hooked everything up, you must go to the Simple.TV website from a device on the same network as the Simple.TV to set up an account. After that, the site presents you with tabs for choosing either live TV, recorded content (My Shows), or the premium service’s electronic program guide, which you can search and use to set up recordings of specific programs or series. You access the Simple.TV's program guide and controls via any browser. Setting up Simple.TV to stream on my Roku required installing the Simple.TV channel and linking it to the Web service using a browser, much the same way you set up Netflix or other on-demand services on the Roku (or, more precisely, other private channels). This took only a few minutes, and produced an interface with icons for accessing live TV, recorded shows, and upcoming recordings; a search widget for locating programs; and a recording setup tool. As with any over-the-air TV tuner, the number of channels you’ll be able to receive depends largely on the location of your antenna. Simple.TV suggests consulting AntennaWeb to determine what stations and channels you can expect to receive at your location, and what type of digital antenna you’ll need. The tuner also supports unencrypted digital cable—in other words, it can record any programs you could watch by plugging a cable directly into a set with an ATSC tuner. In my home, surrounded by tall buildings, I was only able to get about 10 stations, but at the TechHive offices, facing the city’s main broadcast tower, more channels showed up. The Simple.TV's player apps provide pause, fast forward, and 30-second rewind controls. While Simple.TV can record high-def shows, it’s worth noting that the digital channels you may be getting over the air aren’t necessarily sending good quality high def content. In the digital TV transition, the government gave stations enough bandwidth to support uncompressed high-def broadcasting, but they were allowed to use the bandwidth as they pleased—and many chose to broadcast multiple channels of highly compressed high-def video rather than a single uncompressed stream. You can tell if this is going on by the channel numbers: For example, TV listings for San Francisco show that public television station KQED transmits over the air content on three channels (9.1, 9.2, and 9.3). On my Comcast cable service, those channels show up in the standard-definition listings, but KQED does provide a high-def version of its primary channel for Comcast HDTV subscribers—and viewed on my Roku-connected HDTV, a third-generation iPad, and Silverlight-enabled browsers for Mac and Windows notebooks, Simple.TV’s version was visibly poorer in quality. Images were not as crisp, and I noticed occasional pixilation—both in live and recorded content. In general, content looked the best on my iPad—possibly because the lower channel resolution was not as visible on the smaller display as it was on my 42-inch HDTV. The Simple.T's My Shows tab displays recordings with thumbnail images. Also, loading a channel takes a few moments—channel surfers will not be happy. I was able to pause the live TV using my Roku remote, but a few minutes after I restarted the program, the video froze and I had to reload the channel. While Simple.TV supports simultaneous streaming of recorded content to up to five devices, my husband and I noticed some slight skips and freezes when we both streamed content (I over our home network and he from a remote MacBook), possibly reflecting lack of sufficient upstream bandwidth with our cable Internet service. Also, while you can rewind and fast-forward through recordings, there’s no video display to show where you are—just a time code. This makes it difficult to fast-forward through ads, or rewind to a specific point. Simple.TV acknowledges these issues and says it is working to improve performance and usability. The evaluation Simple.TV unit was preconfigured for the premium service, and we were unable to test it without that service. But the company says basic setup is the same—and you can still connect a Roku box. However recording options are severely limited without the premium service’s program guide: You can only record a show while you’re watching it, or set a future recording manually by channel, start and end times. There’s no support for series recording. Once it works out the bugs, Simple.TV could work for a niche group of people who get good DTV reception, have robust upstream Internet connectivity, and want DVR functionality without paying for premium content. But it’s not as inexpensive as it might look at first glance, performance may vary, and you do have to accept some of the limitations of OTA broadcasting in the digital TV era. The Simple.TV offers DVR functionality and remote viewing support for free digital TV, but it still needs work and you'll pay extra for its key features. Can stream simultaneously to up to five browsers, mobile devices, computers, or Roku-connected HDTVs. 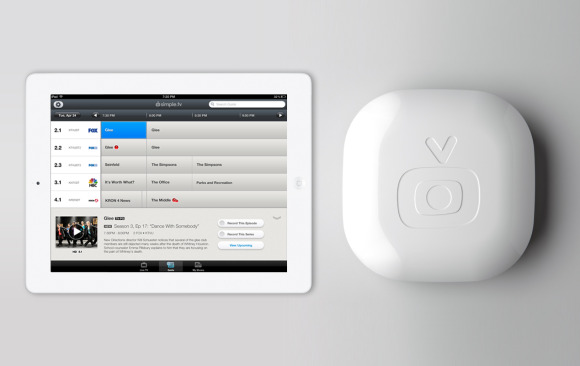 DVR functionality and streaming over the Internet are severely restricted without a premium subscription service. You must provide a USB drive for recording and have decent upstream Internet service.